A magazine can turn out to be a good source of knowledge and information if it belongs to science, knowledge or current affairs genre and is curated genuinely. In that regards we can say that the market is almost flooded with hundreds (if not thousands) of magazines every month/fortnight/week; but not all of them are worthy of one’s time and resources. Safari is a knowledge magazine from India which is running since many years. It had a set back period also, but, eventually, it was revived and is running stronger today. With the limitation of being available only in Gujarati, a regional (famous and popular too) language of India, its reach is limited too. It is worth to note that the magazine has tried publishing its English edition also, but unfortunately, it didn’t survive. Apart from this limitation, you will find almost nothing to complain about the magazine in any issue. 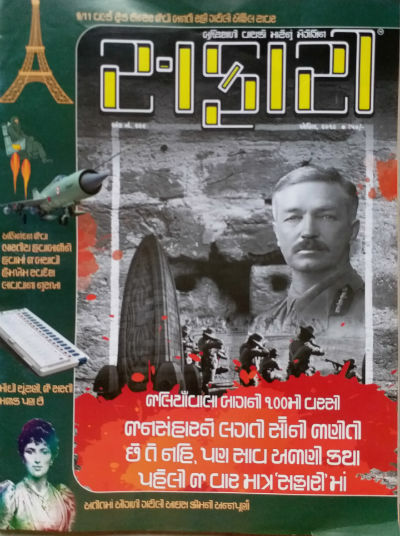 April 2019 issue of Safari Magazine (Gujarati Edition) is published quite on time and hit the newsstands in the first week of April. We, however, were busy with some books and other stuff, so the review is delayed a little. Anyway, it is better late than never, right? Let us take a look at the cover page of the magazine. I strongly believe in the influence of the packaging in purchase decisions. And for a book or a magazine its cover serves the purpose. Of course, ultimately the content is the king. And, no matter how good the packaging is, if the media doesn’t bring something with a substance (or whatever you’ve expected from it), you are not going to repeat the order. In such case a reader (or a buyer/viewer) even feel cheated; and in a large context, it is harmful to the brand value. The cover page of Safari – April 2019 issue is quite interesting. It doesn’t have cheerful colors or not that much eye catcher. However, the main article (mention of which covers the large area of the cover page) is about the story behind the Jaliawala Baugh massacre. And thus the photographs and the illustration in that segment is rightly printed in the black and white colors. The title of the article has blood red (with spots) background which perfectly fits the tragic and shameful incident to humanity. The rest of the cover page is in a dark bottle green color where we can see mentions of various other important articles. Overall, an informative and “goes fine with the theme” yet not that much attractive cover page. Nagendra Vijay – the editor came up with a hard-hitting editorial this month. There are no doubts about his literary skills and fact-finding skills. So, whatever he says has a weightage for sure. The editorial is a very important part of any media, be it a magazine or a newspaper. It not only lets the editor share his views about the content of the issue but also serves as a bridge between the reader and the editor. In this month’s editorial, Nagendra Vijay talks about the election system in India. Being the largest democracy in the world, conduction elections fairly is a mammoth job in India (that is Bharat). Every time, we see the expenditure behind this festival of democracy is skyrocketing and the promises they give to lure the voters are not fulfilled always. So, should India keep this parliamentary government system or should it opt-out for the US like administration system? Well, both the sides have their own strong arguments, and it is good to know the editor’s views on the same. He represented his vision in an unbiased manner by quoting facts and figures. I strongly recommend you to not to skip reading this small yet important part of this issue. The Jallianwala Baugh massacre is not only a shameful incident in the British Rule in India but also for the entire humanity. It was not an action which was ordered spontaneously. It was a pre-planned massacre. The way, the author brought some unknown details based on his research work, quoting various sources, it was planned and executed accordingly. And, even most importantly the executioner – Reginald Dyer – hadn’t any regret than that of having the narrow entrances he couldn’t lead tanks and other big military weapons to execute it the way he thought! There is a lot written about this shameful and tragic incidents, but, it is tough to find a very detailed article talking about the background incidents which actually led to this massacre. Nagendra Vijay, the author, brings in some unknown or lesser-known facts by referring to many sources. The article is studded with so many informative illustrations, historical photographs, and more resources; making it definitely a must read article. Election is the most important incident for a democracy. It is nothing less than a festivala to enjoy the freedom. It gives a chance to the citizens to choose their representatives which ultimately lead to form a governing body for the specific period (in India, it is 5 years). The way the elections should be conducted, monitored and implemented, should be nothing less than a sacred ritual. But, in the present scenario and the way the parliamentarian structure is set up and the way people choose their representatives, is effective in the current time and circumstances? Should we need dramatic changes in the structure of the administrative body? Are political parties playing fair during elections? Doesn’t the tight schedule of the important ministers making them busy with election campaigns lead them to underperform to the governing duties? A very thoughtful and detailed article which tries to analyse the situation. A citizen in any democracy shouldn’t miss it. The recent incident in which IAF wing commander Abhinandan shot down a Pakistani F-16 aircraft in a dog fight resulted into crashing of his own Mig 21 as well. And, he was safe-landed in Pakistan territories. Of course, the political pressure and observation of these incidents of the entire world resulted in the pilot’s timely homecoming. All the fighter pilots are not that lucky and got that much attention. Some of them are tortured for years in the enemy prisons and often met with their inhumane deaths. Ejectulation is a technique through which a fighter pilot can push the panic button and his/her sit was ejected from the airplane. The sit is already equipped with many safety gadgets including a parachute which allows the pilot to land on the earth safely even if the plane can’t. Is there a way we can update this “self-eject” technique which allows escaping pilot a guided landing? If it is possible, the pilot can try landing in his/her own territory rather than falling behind the enemy lines. An article based on this thought, checking all the possibilities, the science, and technology used in making air crafts, education, gliding, and many other areas, is found written in simple words which is very easy to understand. The good thing about this article is the way it talks about science and technology and connects it to a real incident and analyze the possibilities of changing the course of the same. Definitely, a worth reading article. Recommended read. 9/11 was a tragic incident and so does 26/11. These are the incidents where terrorists succeeded in their goal. However, there are many more attacks they have planned (are planning and possibly will keep doing so), which didn’t come to common people’s notice due to various reasons. The primary one is, of course, they were unsuccessful. Do you know that one such attack was planned for Effiel Tower also? Of course, you may know about the recent terror attacks in France and it includes the Effiel Tower. Read the article to know more about the possible outcome it could have? In addition to the loss of human lives and infrastructure, it impacts on the world could have been multifold. Summer has arrived with a bang in India and the temperatures are rising beyond 400 in the beginning only! The tougher and toughest days are yet to come! Well, we cannot control the temperature of the Sun, but we can definitely change our habits, so the summers wouldn’t be crueler. But, let us not talks about that now. In the hot summer days, the selling of cold-drinks, fruit juices, and more importantly ice-cream goes pretty high. The history of ice cream may be an interesting topic to explore during these hot summer holidays. Agnes Marshall, and her Ice Cream Maker, played a significant role in changing the way the ice cream is being made and served. And, the basics she brought in are still used in modern days. She, however, lived a short life and didn’t get the recognition she deserved. A detailed article about Agnes Marshall and her Ice Cream Maker, will definitely bring you some “cool” moments :). A detailed article which is researched for the facts and documents, studded with historical photographs and illustrations; and written very nicely. Shouldn’t India have to fight a war with Pakistan and end the problem of terrorism, breaking cease fires every day,.. etc.? Or should India gave Kashmir to Pakistan the problem will be resolved forever? A very detailed article on this topic is found in this issue of Safari. It is written as an answer to some reader questions. Rather than talking much about it, I will suggest you to go ahead and read it. The Super Quiz and other segments bring in interesting facts and add to the reader’s knowledge; And yes, the “Incredible India” segment is not to be missed at all. Definitely, a magazine which is worth the money and time you spend reading it. It is one of those rare publications which doesn’t contain even a single third party commercial advertisement! The only limitation of the magazine is its limited reach due to its publication is in a regional language.